BPA-free flasks that collapse into pocket-size when you’re done with them. 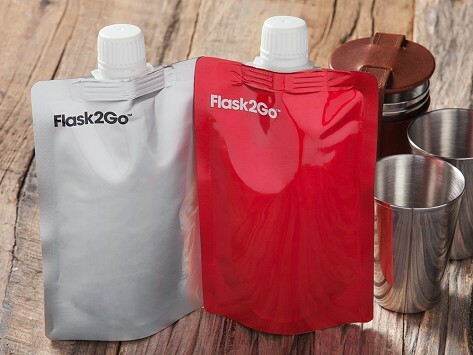 Flask2Go comes with 2 flexible, durable, rollable containers that have zero taste transfer and are great for traveling with any drink of your choice. Dimensions: 4" x 6" x 1"
Convent for kayaking, sports etc. you can carry your wine, or even other drinks for the event. I gave this to my sister as a gift so that she could keep extra mixed drinks cold when they & friends went out on the Pontoon Boat.